One Sentence Summary: Asdrubal Cabrera hit a walk-off home run in the 10th inning, sending the Phillies to a 2-1 victory in a game played entirely in the rain. What It Means: The Braves lost so after the heartbreak of last week, the Phillies are still only two games out of first place. What Happened: Nick Pivetta battled through five innings, allowing a run on five hits. Five relievers then shut down the Cubs offense, capped by a scoreless 10th inning from Pat Neshek. The first Phillies run came courtesy of a Cesar Hernandez single in the 6th, scoring Roman Quinn who had doubled to reach. Featured Card: I've not done a lot of official Chachi Highlight cards this year, but this seemed like a good occasion for one. 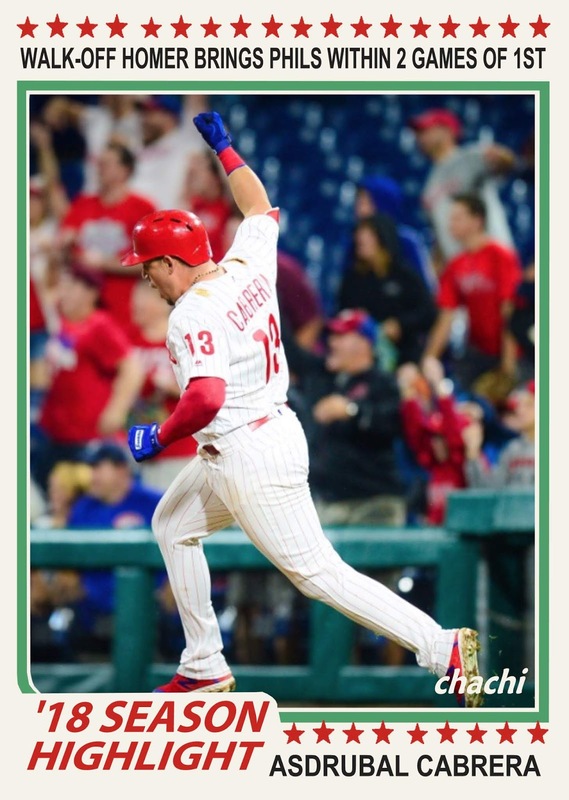 It also solves the problem of not currently having any Cabrera cards in my Phillies collection, although I imagine he'll receive a Topps Now card for his heroics. Field Report: And we were there! Although in the interest of full disclosure we had left well before Cabrera's big hit. 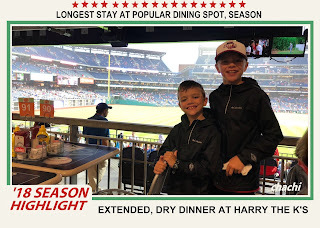 We successfully managed to stretch our dinner at Harry the K's (where it's dry) from a half hour before gametime all the way to the 3rd inning. Slow eating, ordering one thing at a time and the availability of several open tables were the keys to our success. After the top of the 4th, the Phillies played a video tribute to the Cubs' new star pitcher, Cole Hamels. It was a cool moment as Hamels emerged from the Cubs dugout and acknowledged the fans with a wave. 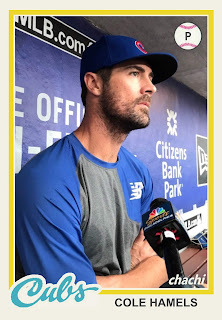 With Hamels' return, I think this means that every member of the 2008 World Champion club returned at some point this season to Citizens Bank Park.